Considerable researches have reported on the design of superstructured materials to exploit synergistic properties derived from building units. However, it is still limited to utilize superstructured materials in diverse ways by manipulating their characteristics and structures according to the required properties. 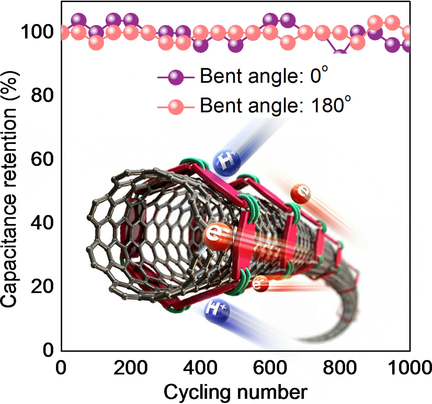 This study presents a novel strategy for utilizing versatile reorganization of metal-polyphenol coordination to design multifunctional macroscopic superstructured materials based on carbon nanotubes (CNTs). The metal-polyphenol compounds surrounding the surface of CNTs adjust surface charges to overcome strong intermolecular van der Waals interaction, thereby forming stable aqueous dispersion. It is possible to assemble distinctive honeycomb-structured CNT aerogel from highly concentrated CNT suspension due to tiny 2D structured TA that connects the CNTs. Furthermore, metal ion and TA on the CNT network can be converted to metal oxide nanoparticle coated with thin carbon layer, which exhibits high potential as an anode material for lithium-ion battery. N-doped hierarchical porous carbon with uniaxially packed carbon nanotubes (CNTs) was prepared by copolymer single-nozzle electrospinning, carbonization, and KOH activation. Densely and uniaxially aligned CNTs improve the electrical conductivity and act as a structural scaffold, enhancing the electrochemical performance of the anode. A partially graphitized N-doped carbon shell, which has a rapid ion accessible pore network and abundant redox sites, was designed to expand the redox sites from the surface of the material to the whole material, including the inner part. As an anode, this material exhibited a superior reversible capacity of 1814.3 mA h g–1 at 50 mA g–1 and of 850.1 mA h g–1 at 1000 mA g–1. Furthermore, the reversible capacity decreased by only 36% after 400 cycles and showed superior rate capability to that of the same material without CNTs, indicating that the CNT acted successfully as a structural scaffold and enhanced the electrical conductivity. This study not only allowed the rational design of the ideal structure of CNT-based carbonaceous anode material, which has both a rapid ion accessible structure and fast electron-transfer path, but also shed light on a potential strategy by which to use CNTs to modify the nitrogen bonding configuration in N-doped carbon for better electrochemical performance. 184. How Can We Make Carbon Nanotube Yarn Stronger? There has been remarkable progress with regard to the fabrication of yarns based on high-performance carbon nanotubes (CNTs). However, the theoretically predicted tensile strength of CNTs has yet to be realized in practical CNT yarns or CNT-reinforced composites. Having considered that there are few systematic guidelines for preparing high-strength CNT yarns, we attempted to revisit the-state-of-the-art progress in the theories and yarn formation processes of CNT yarns and then draw possible correlations between the intrinsic and extrinsic structural parameters of elementary CNTs, yarn formation processes and the tensile strength of the resulting CNT yarns. On the basis of these considerations and discussions of advanced technologies and theoretical approaches, possible routes to improve the strength of CNT yarns further are suggested. The lithium-sulfur (Li-S) battery has been considered as a promising future energy storage device owing to its high theoretical energy density, low cost of the raw active material (sulfur), and its environmental friendliness. On the other hand, there are still challenging issues for the practical applications of Li-S batteries, including low-sulfur utilization, poor cyclability, and rate capability. Although considerable efforts have been made to overcome the current obstacles in Li-S batteries, it is still far from meeting the requirements for the commercialization of Li-S batteries. This review outlines the recent progress in Li-S batteries based on novel configurations, such as incorporating functional interlayers/separators beyond the approach for preparing novel cathodes, and discusses the role of the configuration in Li-S batteries. The functions of the newly introduced functional interlayer/separator are highlighted to address the problems of Li-S batteries. 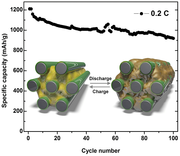 From classification of the functions, the perspectives and outlook are presented to rationally design a novel functional interlayer/separator for high performance Li-S batteries. As future thermoelectric generator (TEG) requires flexibility and mass-producibility, the demand for high-performance TEG based on printed thermoelectric (TE) materials is growing. Herein, we have rationally designed a bracelet-type TEG structure where the carbon nanotube (CNT) ink is printed in the in-plane direction of a flexible cable and the device is operated in the out-of-plane direction of heat source. It is the first report to produce a flexible TEG by printing the TE ink on a curved surface. For printing the CNT ink on a curved surface, the viscosity, dispersibility, and TE performance of the CNT ink have been fundamentally studied. Especially, the mechanism of the solvent effect on the dispersion and viscosity of the CNT ink during planetary ball milling has been clarified. The flexible TEG based on 60 pairs of n- and p-doped CNT ink shows the maximum power output of 1.95 μW at temperature difference of 30 K, which is one of the highest output powers for flexible TEGs based on CNT inks. The ease installment of the bracelet-type TEG on heat sources with various shapes and its ability to harvest waste heat in the out-of-plane direction of heat source has great potential as flexible /or wearable power conversion devices. Information on the possible correlations between the characteristics of graphene itself or the performance of graphene-based devices and the conditions of its preparation or fabrication is scarce. 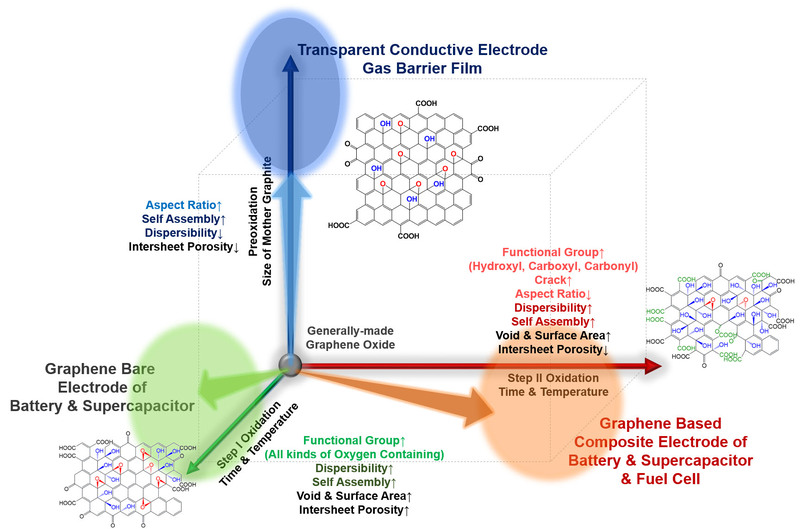 This study examined how the characteristics and performance of graphene in applications, such as batteries and supercapacitors, conductive electrodes, and gas barrier films, change according to the conditions of the adopted process focusing mainly on graphene derived from GO. The overall aim was to determine the possible relationships between the characteristics and the conditions of the oxidation and reduction processes and the performance of devices based on the graphene prepared. Through a deeper understanding of the chemistry involved in the oxidation and reduction processes, possible routes along which the characteristics of graphene from GO can be tuned to a specific application were suggested. These guidelines will provide insights to those wanting to extend their exploration of graphene to new areas, such as catalysts, semiconductors, and biomedical materials. Functional carbon materials have been considered as promising electrode materials for supercapacitor due to large charge-storable surface area, good surface wettability, high electrical conductivity, and additional pseudocapacitance. However, it is still limited to investigate the effect of material parameters of functional carbon materials on electrochemical performance. In this report, we revisit to the correlation between material parameters and capacitance, utilizing nitrogen-enriched porous carbon as a model functional carbon material. Material parameters of N-enriched porous carbon synthesized from melamine cyanurate mesocrystal have been controlled by modulating condition of chemical activation. The contribution of capacitance has been classified through the Trasatti procedure in order to examine the correlation precisely. Furthermore, due to large micropore-scale surface area and high content of surface functionality, the resulting materials exhibit high specific capacitance (328 F g−1 at 0.5 A g−1) and outstanding cycle stability (99.9% of capacitance retention at 5 A g−1 after 5000 cycles) when evaluated as an electrode material for supercapacitor. Displaying information on transparent screens offers new opportunities in next-generation electronics, such as augmented reality devices, smart surgical glasses, and smart windows. Outstanding luminance and transparency are essential for such “see-through” displays to show vivid images over clear background view. Here transparent quantum dot light-emitting diodes (Tr-QLEDs) are reported with high brightness (bottom: ≈43 000 cd m−2, top: ≈30 000 cd m−2, total: ≈73 000 cd m−2 at 9 V), excellent transmittance (90% at 550 nm, 84% over visible range), and an ultrathin form factor (≈2.7 µm thickness). 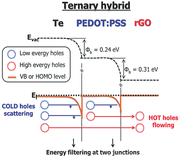 These superb characteristics are accomplished by novel electron transport layers (ETLs) and engineered quantum dots (QDs). The ETLs, ZnO nanoparticle assemblies with ultrathin alumina overlayers, dramatically enhance durability of active layers, and balance electron/hole injection into QDs, which prevents nonradiative recombination processes. In addition, the QD structure is further optimized to fully exploit the device architecture. The ultrathin nature of Tr-QLEDs allows their conformal integration on various shaped objects. Finally, the high resolution patterning of red, green, and blue Tr-QLEDs (513 pixels in.−1) shows the potential of the full-color transparent display. This study reports on a simple and efficient strategy to prepare macroscopically assembled nanostructured porous carbon (MNPC) based on metal-phenolic interactions. The abundant coordination sites contained in tannic acid enable to form a stable, interconnected hydrogel dough. The porosity evolution mechanism during carbonization process is studied by temperature programmed desorption-mass spectroscopy. Hierarchical pore structure of the MNPC can be developed by modulating the zinc chloride content. The resulting material provides versatile adsorption behaviors for various ranging from small gas molecules to larger molecules such as dye, oil and organic solvents. Lithium-sulfur (Li-S) batteries are experiencing a design shift from a closed structure to an open structure to further improve their performance, expanding the design realm from the development of nanostructured materials in the cathode to the production of functional separators. Rational guidelines for preparing a bifunctional separator with exfoliated MoS2 and CNTs are suggested to deal with two conflicting issues: guaranteeing the electron pathway while strongly trapping polysulfide species. In addition, various exfoliation methods ranging from mechanical to chemical were investigated to identify an adequate method for preparing exfoliated MoS2 based-bifunctional separators. The electrochemical exfoliation method was found to be effective in not only exfoliating high quality MoS2 in terms of the lateral size and number of layers, but also providing a favorable MoS2 phase, 1T metallic MoS2. A bifunctional separator of 1T exfoliated MoS2@CNT in a tandem configuration (layer-by-layer structure)-coated Celgard rather than a hetero-configuration delivered excellent electrochemical performance of ~670 mAh g-1 after 500 cycles at a high current density of 1 C. In addition, the separator was highly effective in trapping polysulfide species and facilitating electron transfer to the irreversible discharge products. The rational guidelines suggested in this study will be extended to other two-dimensional transition-metal dichalcogenides, and applied to the development of other functional membranes. A novel dual imprinting method is suggested to synthesize pyridinic N‐enriched, hierarchically porous carbon. Rose‐like melamine cyanurate (MCA) mesocrystal is prepared by simple self‐assembly and utilized as a sacrificial template. The unique morphological and chemical features of the MCA are imprinted into the carbon source during carbonization. Curled graphene‐like layers with a high nitrogen content (19.9 at%, especially 8.9 at% of pyridinic N) are interconnected to form a unique red blood cell‐shaped morphology with a hierarchical pore structure. 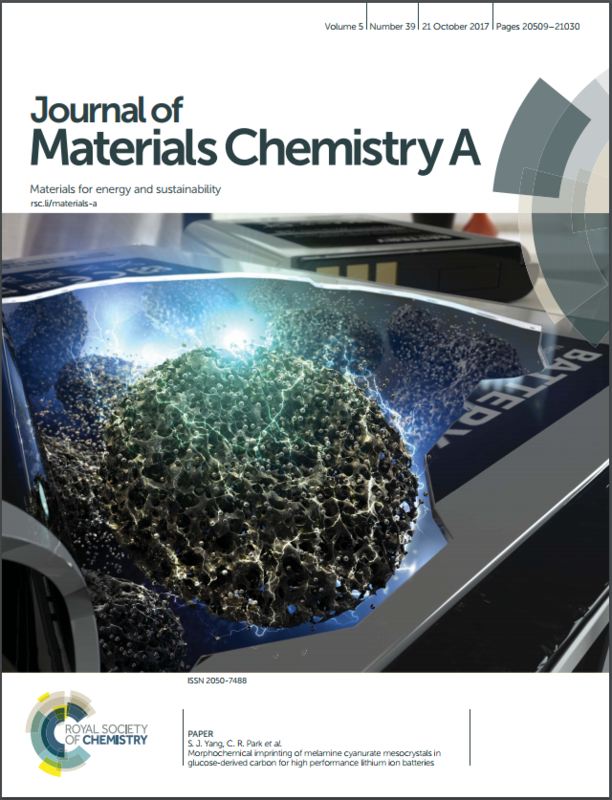 The resulting material exhibits outstanding electrochemical performance (2019 mAh g‐1 at 100 mA g‐1 and 643 mAh g‐1 at 2000 mA g‐1 after 250 cycles) when evaluated as an anode material for lithium ion batteries. Furthermore, this novel imprinting strategy can provide a simple and efficient methodology to produce pyridinic N‐enriched, hierarchically porous carbonaceous materials for extensive applications. Chemoresistive gas sensors based on two-dimensional (2D) materials including graphene-based materials have attracted significant research interests owing to their potential use in the next-generation technologies including the Internet of Things (IoT). The functionalization of 2D materials is considered as a key strategy to achieve superior gas sensing properties such as high selectivity, high sensitivity, and reversible response and recovery, because it can modulate the chemical and electrical properties of 2D materials for more efficient gas sensing. Herein, we present a facile solution process and room temperature gas sensing properties of chemically fluorinated graphene oxide (CFGO). The CFGO sensors exhibit improved sensitivity, selectivity, and reversibility upon exposure to NH3 with a significantly low theoretical detection limit of ~6 ppb at room temperature in comparison to NO2 sensing properties. The effect of fluorine doping on sensing mechanism is examined by the first-principles calculations based on density functional theory. The calculations reveal that the fluorine dopant changes the charge distribution on the oxygen containing functional groups in graphene oxide, resulting in the preferred selective adsorption and desorption of NH3 molecules. We believe that the remarkable NH3 sensing properties of CFGO and the investigation by the calculations would enlarge the possibility of functionalized 2D materials for practical gas sensing applications such as IoT. Graphene oxide liquid crystals (GO LC) prove their potential usefulness in a new design of carbon scaffold composites with ordered structures from nano to macro scale. This paper highlights the degree of GO functionalization as a notable influencing factor on GO LC formation. The large amount of oxygen functional groups, which cause secondary interactions between GOs, decrease the critical concentration for the phase transitions from isotropic to biphasic to nematic phases. In the biphasic state where isotropic and anisotropic phases coexist, highly oxidized GO sheets spontaneously develop LC phases among themselves. Furthermore, the strong hydrogen bonding networks between GO sheets govern the stabilization of the GO aqueous dispersion for a long period. This unique behavior can be used to design GO based architecture with controllable density and ordering. We report a tremendous structural evolution of carbon nanosheets (CNSs) through the graphenization of isotropic pitches prepared by reforming commercially available naphtha cracking bottom oil. CNSs with thicknesses of 2–13 nm were prepared by spin-coating on quartz substrates directly without a catalytic material, followed by two successive thermal treatments consisting of stabilization at 270 °C in air and carbonization at up to 1200 °C in H2/Ar. 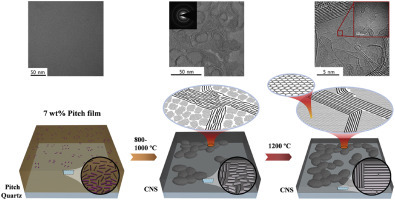 The development of well-ordered graphene layers around pebble-like structures with increasing carbonization temperature was observed in only the 13-nm thick CNSs by transmission electron microscopy, whereas thin CNSs did not reveal well-developed fringe growth. In addition, Raman, UV–vis, and X-ray photoelectron spectroscopies along with mass spectrometry unanimously showed clear evidence indicating that unusually well-developed crystalline structure was formed in the thick CNSs. It should be noted that isotropic pitches, which are intrinsically non-graphitizable carbon sources, evolved into highly ordered structures at a relatively low carbonization temperature (1200 °C). We believe that the graphenization of spin-coated films of pitch molecules resulted from the condensation of small pitch molecules and their self-assembled structure during carbonization under the anisotropic pressure induced by significant shrinkage in the vertical axis. As practical interest in flexible/or wearable power-conversion devices increases, the demand for high-performance alternatives to thermoelectric (TE) generators based on brittle inorganic materials is growing. Herein, we propose a flexible and ultralight TE generator (TEG) based on carbon nanotube yarn (CNTY) with excellent TE performance. The as-prepared CNTY shows a superior electrical conductivity of 3147 S/cm due to increased longitudinal carrier mobility derived from highly-aligned structure. Our TEG is innovative in that the CNTY acts as multi-functions in the same device. The CNTY is alternatively doped into n- and p-types using polyethyleneimine and FeCl3, respectively. The highly conductive CNTY between the doped regions is used as electrodes to minimize the circuit resistance, thereby forming an all-carbon TEG without additional metal deposition. A flexible TEG based on 60 pairs of n- and p-doped CNTY shows the maximum power density of 10.85 and 697 μW/g at temperature differences of 5 and 40 K, respectively, which are the highest values among reported TEGs based on flexible materials. We believe that the strategy proposed here to improve the power density of flexible TEG by introducing highly aligned CNTY and designing a device without metal electrodes shows great potential for the flexible/or wearable power-conversion devices. We present a systematic and simple approach to produce high-strength carbon nanotube fibers (CNTFs) with electrical conductivity in the high performance range (>1000 S/cm). We studied several critical parameters to improve the mechanical properties of CNTFs by aryl cross-linking reaction. Both the molecular dynamics (MD) simulations and experimental results showed that the mechanical properties strongly depended on the degree of cross-linking, length of cross-linkers, and CNT diameter. The monobenzene (MB) covalent bonding between CNTF with double-walled CNTs (DWCNTs) showed the highest load transfer, resulting in significantly enhanced specific tensile strength (3.7 N/tex) and Young's modulus (210 N/tex) which are superior to the strongest commercial carbon fiber (3.6 N/tex and 180 N/tex), respectively. Furthermore, the mechanical properties of aryl cross-linked CNTF exhibited no significant change in strength with sample size of CNTFs, showing uniformity of strength with increasing degree of cross-linking. The electrical conductivity of the MB cross-linked CNTFs was ∼1400 S/cm, which is higher than the best value of commercial carbon fibers (715 S/cm). These results demonstrate that aromatic linker between CNTFs can significantly enhance mechanical properties without significant loss of electrical conductivity. These molecular engineering with MD simulations provide an important route to design and develop ultra-high-performance fibers. The gas permeability of reduced graphene oxide (rGO) films is influenced by controlling the lateral size and void generation. The low gas permeability was achieved by the controlled parent graphene oxide (GO) synthesis. The organic device lifetime using rGO-coated barriers was prolonged by 65.9 times when compared to bare samples. A facile purification method for oxidized carbon nanotubes (CNTs) is developed to preserve acidic carbon compounds (ACCs) for achieving high-quality dispersion of CNTs. The remaining ACCs, which originated from the surface destruction of CNTs during the oxidation process, are considered to play a crucial role in the dispersion of CNTs in water and various polar protic solvents. To elucidate the concrete role of ACCs, a direct titration method is applied to quantitatively investigate the degree of ionization of both CNTs and ACCs in their aqueous dispersions. While the ACCs with strong carboxylic groups (pKa around 2.9) are easily removed by the neutral or base washing of oxidized CNTs, which is common in the purification process, ACC selective purification using acid washing preserves the ACCs attached to CNTs, thereby effectively stabilizing CNT dispersions in aqueous solutions. Additionally, the Hansen solubility parameters (HSPs) of ACC-preserved and ACC-removed CNTs were determined by the inverse gas chromatography (IGC) method to estimate their miscibility in various solvents. The preserved ACCs significantly influenced the dispersibility of CNTs in polar protic solvents, which may widen the possible application of CNTs. Specifically, the ACC-preserved high-quality CNT dispersion produces high performance CNT buckypaper with densely-packed nanostructures. The Young’s modulus and tensile strength of these buckypapers reaches up to 12.0 GPa and 91.0 MPa, respectively, which exceed those of ACC-removed CNTs in previous reports. This paper introduces poly(ethylene oxide) (PEO)-based modification of graphene oxide (GO) layers through the grafting onto the surface of GO as one of the excellent tools to improve the solubility and the processing ability of graphene. Methylene blue (MB)-mediated intercalation of graphite (flake) was first performed at 25 o C in aqueous media, followed by the Hummers’ process for oxidation, leading to an efficient production of GO. Direct oxidation of graphite (powder) also yielded the corresponding GO. The reaction of neutralized GO with “living” PEOs synthesized from alkyllithium- or sodium azide-initiated polymerization of ethylene oxide (EO) in polar solvents led to the production of the corresponding graphene oxide-gPEOs soluble in different solvents such as tetrahydrofuran (THF), methanol, dimethyl sulfoxide (DMSO), and H2O, etc. The resulting products were characterized by the combination of size exclusion chromatographic, 1 H nuclear magnetic resonance (1 H NMR), Raman, thermogravimetric anlysis (TGA), transmission electron microscopy (TEM), and atomic force microscopy (AFM) analyses. Future electronic applications such as wearable electronics depend on the successful construction of energy storage devices with superior flexibility and high electrochemical performance. However, these prerequisites are challenging to combine: external forces often cause performance degradation while the trade-off between the required nanostructures for strength and electrochemical performance results only in energy storage. In this paper, we present a flexible supercapacitor design based on tannic acid (TA) and carbon nanotubes (CNTs) with a unique nanostructure. Here, TA is self-assembled on the surface of the CNTs by metal-phenolic coordination bonds which provides the hybrid film with both, high strength and high pseudocapacitance. Besides a 17 times increased mechanical strength of the final composite, the hybrid film simultaneously exhibits excellent flexibility and volumetric capacitance. We prepared liquid phase exfoliated edge-selectively oxidized graphene (LPEOG) with a high concentration in water (∼14.7 mg ml−1) and a high ratio of a single layer (70%). The edge of graphite was selectively oxidized by step II oxidation of the modified Hummers method, and we subsequently exfoliated the edge-selectively oxidized graphite (EOG) into LPEOG. The edge selective oxidation of the LPEOG was confirmed by X-ray photoelectron spectroscopy (XPS), X-ray diffraction (XRD), zeta-potentiometry, Raman spectroscopy, Fourier-transform infrared spectroscopy (FT-IR), atomic force microscopy (AFM), and transmission electron microscopy (TEM). The highly concentrated LPEOG ink can be used in solution processing such as simple drawing or spin casting. Reduced LPEOG showed a higher conductivity (120 000 S m−1) than that of reduced graphene oxide (68 800 S m−1) despite the small lateral size. A transparent conducting film prepared from the LPEOG ink showed a lower surface resistance (∼2.97 kΩ sq−1) at a higher transmittance (>83.0 %T) compared to those of the graphene oxide based film. These results indicate that preservation of π-conjugation of the basal plane of graphene is critical for electrical performance of graphene. Our method facilitates solution processing of graphene for a wide range of applications. Graphene oxide (GO) has been synthesized by the Hummers method with modification of experimental condition by different research groups, but there is no guideline to prepare tailored GO for targeted applications. In this research, we suggest a guideline for tailor-fittable functionalization of graphene on the basis of the scope of our previous report on the two-step oxidation of GO. We describe a detailed procedure for synthesis of GO, effects of degree of step I oxidation on characteristics of GO and comparing them with effects of degree of step II oxidation. Characteristic changes of GO occurring during step I oxidation and those occurring during step II oxidation are different in species of oxygen functional groups, interlayer spacing, thermal stability, size distribution, and yield of GO. Based on the results, three types of tailor-fitted GO for a fiber, transparent conducting film, and hydrogen storage material are synthesized by controlling the degree of step I and step II oxidation. Compared to the reference GO synthesized by conventional modified Hummers method, the tailor-fitted GO showed 33.5 %, 117 %, and 104 % enhanced performance in strength of the fiber, figure of merits of transparent conducting film, and hydrogen storage, respectively. Our results show that the performance of GO based application is significantly influenced by the synthesis condition of GO, and optimized performance of the applications can be obtained by the tailor-fitted functionalization of GO. We anticipate that this study would be helpful for a variety of researches, both synthesis and application of GO. In this study, we have developed an efficient and scalable method for improving the mechanical properties of carbon nanotube (CNT) fibers. The mechanical properties of as-synthesized CNT fibers are primarily limited by their porous structures and the weak bonding between adjacent CNTs. These result in inefficient load transfer, leading to low tensile strength and modulus. In order to overcome these limitations, we have adopted chemical vapor infiltration (CVI) to efficiently fill the internal voids of the CNT fibers with carbon species which are thermally decomposed from gas phase hydrocarbon. Through the optimization of processing time, temperature, and gas flow velocity, we have confirmed that carbon species formed by thermal decomposition of acetylene (C2H2) gas successfully infiltrated into porous CNT fibers and densified them at relatively low temperatures (650–750 °C). As a result, after CVI processing of the as-synthesized CNT fibers under optimum conditions, the tensile strength and modulus increased from 0.6 GPa to 1.7 GPa and from 25 GPa to 127 GPa, respectively. The CVI technique, combined with direct spinning of CNT fibers, can open up a route to fast and scalable fabrication of high performance CNT/C composite fibers. In addition, the CVI technique is a platform technology that can be easily adapted into other nano-carbon based yarn-like fibers such as graphene fibers. The thermal decomposition behavior of multi-walled carbon nanotubes (MWCNTs) was revisited to prepare partially opened MWCNTs by a simple air oxidation method which allows massproductivity. As a promising matrix for sulfur cathodes, the partially opened MWCNTs can incorporate sulfur in hidden internal areas in the carbon nanotubes, leading to a homogeneous distribution through the MWCNT matrix. The resulting materials enable Li-S batteries to exhibit greatly enhanced electrochemical performance. The air plasma spraying method has a problem in the formation of many splat boundaries throughout the plasma sprayed layer, which seriously degrades mechanical properties of the metal layer. In order to improve the mechanical properties of air plasma sprayed tungsten (APS-W) by reducing the splat boundaries, a pulsed electric current is applied on as-sprayed specimens. Through microstructure observations and microhardness measurements, it was confirmed that the reduction of splat boundaries and the increase of hardness were obtained. The results are compared with those of APS-W annealed using induction heating under the same temperature, time and pressure. Flexible lithium ion batteries (LIBs) are promising energy storage devices that can facilitate the advancement of wearable and flexible electronics. The main drawbacks of flexible LIB development are their low energy densities, poor mechanical strengths, and lack of flexibility. In this paper, we developed a facile method to prepare flexible and freestanding LIBs by modifying the CNT yarn (CNTY) synthesis. Iron catalysts in CNTYs were directly converted to electrochemically-active Fe2O3 nanoparticles featuring homogeneous distribution without agglomeration, monodisperse, and tight adhesion to CNT. This unique microstructure in the electrochemically activated CNTY (A-CNTY) electrode contributed to a good electrochemical performance (capacity, cyclability, and rate capability) of the resulting CNTY when evaluated as an anode material for LIB. We also fabricated a flexible fiber battery prototype composed of A-CNTY anode and commercially available lithium iron phosphate coated CNTY cathode with a gel electrolyte. The fabricated batteries are 30 cm-long with a diameter of a few hundred micrometers. In addition, our CNTY-based flexible LIBs are able to endure deformation without any substrates due to the good mechanical properties of CNTY. Our fiber type LIBs were able to successfully power various LED lights even during deformation. Current approaches in use of water-insoluble photosensitizers for photodynamic therapy (PDT) of cancer often demand a nano-delivery system. 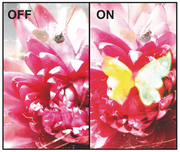 Here, we report a photosensitizer-loaded biocompatible nano-delivery formulation (PPaN-20) whose size was engineered to ca. 20 nm to offer improved cell/tissue penetration and efficient generation of cytotoxic singlet oxygen. PPaN-20 was fabricated through the physical assembly of all biocompatible constituents: pyropheophorbide-a (PPa, waterinsoluble photosensitizer), polycaprolactone (PCL, hydrophobic/biodegradable polymer), and Pluronic F-68 (clinically approved polymeric surfactant). Repeated microemulsification/evaporation method resulted in a fine colloidal dispersion of PPaN-20 in water, where the particulate PCL matrix containing well-dispersed PPa molecules inside was stabilized by the Pluronic corona. Compared to a control sample of large-sized nanoparticles (PPaN-200) prepared by a conventional solvent displacement method, PPaN-20 revealed optimal singlet oxygen generation and efficient cellular uptake by virtue of the suitably engineered size and constitution, leading to high in vitro phototoxicity against cancer cells. Upon administration to tumor-bearing mice by peritumoral route, PPaN-20 showed efficient tumor accumulation by the enhanced cell/tissue penetration evidenced by in vivo near-infrared fluorescence imaging. The in vivo PDT treatment with peritumorally administrated PPaN-20 showed significantly enhanced suppression of tumor growth compared to the control group, demonstrating great potential as a biocompatible photosensitizing agent for locoregional PDT treatment of cancer. As commercial interest in flexible power-conversion devices increases, the demand for high-performance alternatives to brittle inorganic thermoelectric (TE) materials is growing. As an alternative, we propose a rationally designed graphene/polymer/inorganic nanocrystal free-standing paper with high TE performance, high flexibility, and mechanical/chemical durability. The ternary hybrid system of the graphene/polymer/inorganic nanocrystal includes two hetero­junctions that induce double-carrier filtering, which significantly increases the electrical conductivity without a major decrease in the thermopower. The ternary hybrid shows a power factor of 143 μW m−1 K−1 at 300 K, which is one to two orders of magnitude higher than those of single- or binary-component materials. In addition, with five hybrid papers and polyethyleneimine (PEI)-doped single-walled carbon nanotubes (SWCNTs) as the p-type and n-type TE units, respectively, a maximum power density of 650 nW cm−2 at a temperature difference of 50 K can be obtained. The strategy proposed here can improve the performance of flexible TE materials by introducing more heterojunctions and optimizing carrier transfer at those junctions, and shows great potential for the preparation of flexible or wearable power-conversion devices. A bioinspired hydrogen storage medium uses polydopamine (PD) which acts as a reducing agent, functionalizer, and strong metal binder. By controlling the degree of functionalized PD on graphene, the specific surface area of three-dimensionally interconnected graphene foam can be controlled. In addition, the functionalization degree of PD affects the size, distribution, and amount of platinum (Pt) nanoparticles decorated on the foam. By combining a high surface area and a uniform distribution of small sized Pt nanoparticles, the Pt-decorated PD-functionalized graphene (rGO/PD_Pt) exhibits a high hydrogen storage capacity of 3.19 wt.% at room temperature and 100 bar, which is the best hydrogen storage medium exhibiting the highest hydrogen uptake per unit specific surface area. The self-assembled nanostructures of carbon nanomaterials possess a damagetolerable architecture crucial for the inherent mechanical properties at both micro- and macroscopic levels. Bone, or “natural composite,” has been known to have superior energy dissipation and fracture resistance abilities due to its unique load-bearing hybrid structure. However, few approaches have emulated the desirable structure using carbon nanomaterials. In this paper, we present an approach in fabricating a hybrid composite paper based on graphene oxide (GO) and carbon nanotube (CNT), mimicking the natural bone structure. The size-tuning strategy enables smaller GO sheets to have more cross-linking reactions with CNTs and be homogeneously incorporated into CNT-assembled paper, which is advantageous for effective stress transfer. The resultant hybrid composite film has enhanced mechanical strength, modulus, toughness, and even electrical conductivity compared to previously reported CNT-GO based composites. We further demonstrate the usefulness of the size-tuned GOs as the “stress transfer medium” by performing in-situ Raman spectroscopy during the tensile test. Hummers method has been used for fifty years to prepare graphene oxide (GO) by oxidizing graphite using Mn2O7. In this work, a new angle on Hummers method is described. The oxidation procedure before the addition of water, which has been respected as the main oxidation step of Hummers method, is named step I oxidation and the widely ignored further oxidation step after the addition of water is named step II oxidation. The chemical and structural evolutions during step II oxidation was demonstrated for the first time using various techniques including AFM, DLS, XPS, UV-Vis, FT-IR, 13C NMR and zeta-potentiometry. Step II oxidation influences the size of GO, defects within the layers, and functional groups on the surface, which affect the thermal stability of GO and the properties of resultant thermally reduced GO. This work provides new chemical insights into GO and guidelines for preparation of tailor-fitted GO. Lithium–sulfur (Li–S) batteries are attractive due to a high theoretical energy density and low sulfur cost. However, they have critical drawbacks such as drastic capacity fading during cycling, especially under high current density conditions. 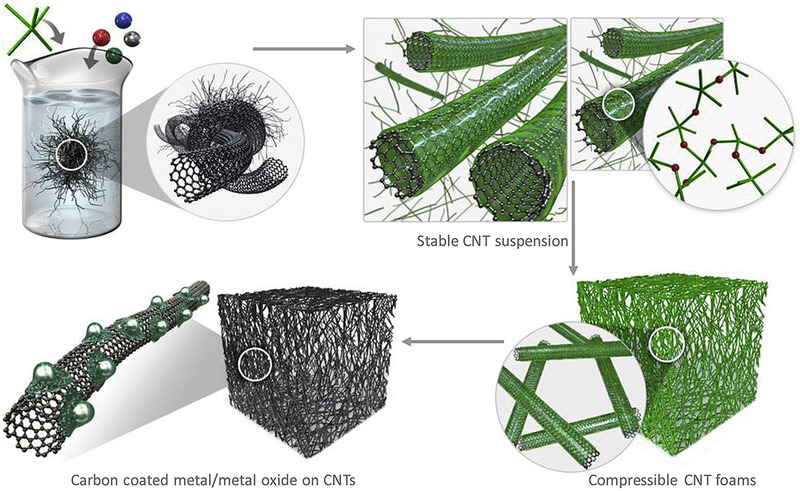 We report a suitable carbon matrix based on partially unzipped multi-walled carbon nanotubes (UZ.CNTs), which have favorable properties compared to multi-walled carbon nanotubes (MWCNTs) and fully unzipped nanoribbons (UZ.NRs). Partially unzipped walls of MWCNTs lead to increased surface area and pore volume with a retained electron conduction pathway. This also provides accessible inner pores as a stable reservoir for polysulfides. This reservoir is decorated with newly introduced oxygen containing functional groups, and affords a synergistic effect of shortening the depth that electrons penetrate and interacting with polysulfides for high-performance Li–S batteries. The synergistic effect is revealed by Monte Carlo simulations. 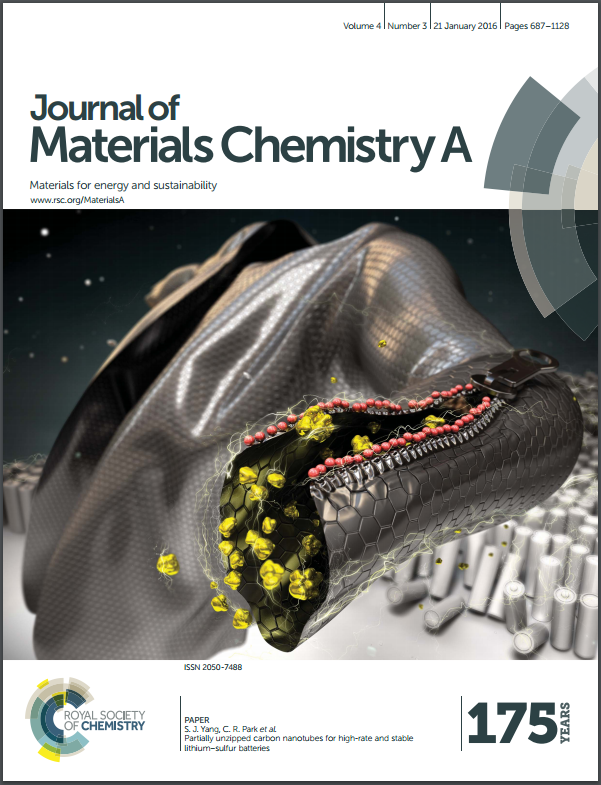 The resulting partially unzipped MWCNT sulfur composite delivers 707.5 mA h g−1 at the initial discharge and retains 570.4 mA h g−1 after 200 cycles even at a high current rate of 5C (8375 mA g−1). Functionalization is one of the key procedures for real applications of carbon nanotube (CNT) as it involves the generation of the acidic functional groups on their surfaces. In these procedures, precise elucidation of these surface acidic groups is significant for the proper utilization of the functionalized CNT. For easy characterization of the practical acidic groups on CNT, one-pot titration methodology is developed, breaking the boundary between the conventional indirect and direct titration methods. The practical acidic functional groups including carboxylic, lactonic, and phenolic groups were successfully computed from the acid ionization constant (pKa) distribution from the direct titration of nitric acid-oxidized multi-walled CNT by means of a one-pot titration methodology. These results were fairly identical to the results of the popular indirect titration method, showing that the developed methodology is essentially applicable for the surface characterization of acidic groups on CNT and potentially extended to the other carbon nanomaterials. To allow for the use of graphene in various nanoelectronic applications, the methods for the large-scale production of graphene with controllable electrical properties need to be developed. Here, we report the results of a fundamental study on the remarkable conversion between n- and p-type reduced graphene oxide (rGO) with changes in the thermal annealing temperature. It was found that the charge carriers in rGO for temperatures of 300–450 °C and 800–1000 °C are electrons (n-type), whereas for temperatures of 450–800 °C, they are holes (p-type). This is because the individual oxygen functional groups present on rGO are determined by the annealing temperature. We found that the predominance of electron-withdrawing groups (i.e., carboxyl, carbonyl, and sp3-bonded hydroxyl, ether, and epoxide groups) resulted in p-type rGO, while that of electron-donating groups (sp2-bonded hydroxyl, ether and epoxide groups) lead to n-type rGO. In addition, as a proof of concept, a flexible thermoelectric device consisting of GO-700 and GO-1000 as p-type and n-type components, respectively, was fabricated. This device, which contained eight pairs of the two components, exhibited an output voltage of 4.1 mV and an output power of 41 nW for ΔT = 80 K. These results demonstrate that the carrier characteristics of rGO can be altered significantly by changing the functional groups present on it, thus allowing it to be used in various applications including flexible thermoelectrics. As commercial interest in flexible power-conversion devices increases, the demand is growing for high-performance alternatives to brittle inorganic thermoelectric materials. As an alternative, we propose a flexible single-walled carbon nanotube (SWCNT)-doped tellurium nanowire (TeNW) hybrid film and, for the first time, rationally engineer the work function of the SWCNTs to effectively filter charge carriers in an energy-dependent manner at the interfaces between the carbon and the inorganic semiconductor. The acid treatment used to control the SWCNT work function allows the interfacial barrier between the SWCNT and the TeNW to be raised and lowered. While the hybrid film with a large barrier of 0.82 eV has a low power factor due to poor carrier transfer, the power factor (3.40 μW·m−1·K−2) in the film with a lower barrier of 0.23 eV is several times higher than that of either pure TeNW or hybrid film with 0.82 eV due to effective energy filtering effect. The transport characteristics of the hybrid film are explored to quantitatively elucidate the carrier filtering at the SWCNT-TeNW interfaces. These demonstrate the effectiveness of optimizing SWCNT work functions to improve the thermoelectric properties of SWCNT/TeNW hybrid films, thus indicating that this strategy can be applied to flexible/or wearable thermoelectrics. Reduced graphene oxide (rGO) is one of the promising sensing elements for high-performance chemoresistive sensors because of its remarkable advantages such as high surface-to-volume ratio, outstanding transparency, and flexibility. In addition, the defects on the surface of rGO, including oxygen functional groups, can act as active sites for interaction with gaseous molecules. However, the major drawback of rGO-based sensors is the extremely sluggish and irreversible recovery to the initial state after a sensing event, which makes them incapable of producing repeatable and reliable sensing signals. Here, we show that pristine GO can be used as the active sensing material with reversible and high response to NO2 at room temperature. First-principles calculations, in conjunction with experimental results, reveal the critical role of hydroxyl groups rather than epoxy groups in changing metallic graphene to the semiconducting GO. We show that the adaptive motions of the hydroxyl groups, that is, the rotation of these groups for the adsorption of NO2 molecules and relaxation to the original states during the desorption of NO2 molecules, are responsible for the fast and reversible NO2 sensing behavior of GO. Our work paves the way for realizing high-response, reversible graphene-based room-temperature chemoresistive sensors for further functional convergence. Continuous efforts have been made to attain high performance Li-S batteries by preventing loss of soluble polysulfides, whereas issues related to insoluble discharge products, Li2S2 and Li2S, have been underestimated. In this paper, we demonstrate that facile and mild method, diazotization, enables uniform functionalization on the surface of ordered mesoporous carbon (CMK-3) with aniline functional groups while it does not deteriorate the original CMK-3 microstructure. The aniline groups possess favorable interactions with insoluble discharge products. Thus, they homogeneously distribute the insoluble discharge products during cycling. The proposed materials exhibit outstanding electrochemical properties with regards to stability (920 mAh g-1 at 0.2 C after 100 cycles) and rate capability (814 mAh g-1 at 1 C) when evaluated as a cathode material for lithium sulfur batteries. Polymer-infiltrated carbon nanotube yarns (CNTYs) were prepared to enhance the mechanical and electrical properties of CNTYs through physical interactions. This work additionally explored the role of the polymer in altering the structures of the CNTYs. The reticulate structures of the CNTYs produced through aerogel methods were infiltrated with a dilute (0.05 wt%) solution of polystyrene (PS), polyacrylonitrile (PAN), or polyvinyl alcohol (PVA), and the structures were characterized. The performances of the CNTYs were closely related to the junction strength and the bundle size in the reticulate CNTYs. Among the three polymers examined, infiltration of PVA—the polymer with the poorest affinity toward CNTs—yielded the greatest improvement in the mechanical and electrical properties of the CNTY. The CNTY deformation properties at each stage of the stress–strain curves could be explained based on the effects of the polymer infiltration on the structure and properties of the CNTY. The results indicated that the specific stiffness, specific strength, toughness, and electrical conductivity are significantly influenced by the molecular-level coupling between the polymer, the CNTs, and the internal structure of the CNTY. Length of multi-walled carbon nanotube (MWCNT) has strong impact on mechanical strength of MWCNT/polymer composite. In this paper, MWCNT/polyamide 6, 6 (PA 66) composites using ten different MWCNTs were prepared by melt processing. The harsh mixing process used to achieve a fine dispersion of MWCNTs in the polymer matrix broke and severely reduced the lengths of the MWCNTs. The characteristics of MWCNTs that influence the breakage and length reduction were systematically and experimentally explored. Insights into designing the microstructures and morphological properties of pristine MWCNTs were provided, based on the correlation data and statistical evaluation results, in an effort to preserve the high aspect ratio of the MWCNTs during the melt mixing process, thereby expecting the enhanced mechanical properties of the composite. The previous studies on SnO2 as electrode materials convey a message that the inevitable pulverization of SnO2 particles can be resolved by carbon-based materials. Since graphene has also proved effective for the harmful decrepitation of the particles with an advantage of electronic conductivity, wrapping SnO2 by sufficient amount of graphene seems to be an answer to enhancing its cycle life. On the other hand, severe wrapping of SnO2 by graphene is deleterious to its rate capability due to the sluggish motion of Li+ through the stacked graphene layers. Thus, in order to make graphene sheets favorable for Li-ion diffusion, they were modified to have large porosity with 3-D architectures, by a simple heating-rate control. The porous graphene-wrapped SnO2, having direct diffusion channels for Li+, outperforms the SnO2 with less-porous graphene. Consequently, the excellent performances are fulfilled, showing both stable cyclability (∼1100 mAh g-1 up to 100 cycles) and high rate capability (∼690 mAh g-1 under 3600 mA g-1). This strategy using porosity-tuned graphene sheet furnishes a valuable insight into the effective encapsulation of active materials, especially for those undergoing pulverization during cycling. In this work, we examined the reasons underlying the humidity-induced morphological changes of electrospun fibers and suggest a method of controlling the electrospun fiber morphology under high humidity conditions. We fabricated OPV devices composed of electrospun fibers, and the performance of the OPV devices depends significantly on the fiber morphology. The evaporation rate of a solvent at various relative humidity was measured to investigate the effects of the relative humidity during electrospinning process. The beaded nanofibers morphology of electrospun fibers was originated due to slow solvent evaporation rate under high humidity conditions. To increase the evaporation rate under high humidity conditions, warm air was applied to the electrospinning system. The beads that would have formed on the electrospun fibers were completely avoided, and the power conversion efficiencies of OPV devices fabricated under high humidity conditions could be restored. These results highlight the simplicity and effectiveness of the proposed method for improving the reproducibility of electrospun nanofibers and performances of devices consisting of the electrospun nanofibers, regardless of the relative humidity. In this research, we have analyzed the electrochemical characteristics of the different rGO/Co3O4 composites prepared by controlling the rGO surface characteristics and its relationship between the growth of Co3O4 nanoparticles and the performance of the pseudocapacitor. Reduced graphene oxide/cobalt oxide (rGO/Co3O4) nanocomposites of different morphologies were prepared through the simple hydrothermal method. First, different kinds of graphite precursors, crumpled and planar with different properties, were used to determine the most suitable substrate to grow Co3O4 nanoparticles. As a result, rGO/Co3O4composite synthesized from planar graphite shows a higher specific capacitance of 207.2, 170.1, and 141.5 Fg−1 at 1, 2, and 5 Ag−1 than the one prepared from crumpled graphite. In the second part, planar graphite, confirmed to be the most suitable substrate from the previous part, was oxidized under various oxidation conditions to increase the oxygen functional groups attached on the GO surfaces and observed to see how it affects the growth of Co3O4 nanoparticles and its influence on the electrochemical performance of the rGO/Co3O4 pseudocapacitor. As a result, the one with the largest amount of functional groups had the Co3O4 nanoparticles well dispersed and grown on the rGO substrate in small nanoparticle sizes, as small as 5.9 nm, leading to an improved electrochemical performance. Thus, the specific capacitance with the least amount of oxygen functional groups are 207.2, 170.1, and 141.5 Fg−1 and for the largest amount of functional groups are 411.5, 371.4, and 292.7 Fg−1, at 1, 2, and 5 Ag−1 respectively. This approach could become a guideline for the ideal fabrication of rGO/metal oxide composite for further research involving rGO based pseudocapacitors. A controlled assembly and alignment of carbon nanotubes (CNTs) in a high-packing density with a scalable way remains challenging. This paper focuses on the preparation of self-assembled and well-aligned CNTs with a densely packed nanostructure in the form of buckypaper via a simple filtration method. The CNT suspension concentration is strongly reflected in the alignment and assembly behavior of CNT buckypaper. We further demonstrated that the horizontally aligned CNT domain gradually increases in size when increasing the deposited CNT quantity. The resultant aligned buckypaper exhibited notably enhanced packing density, strength, modulus, and hardness compared to previously reported buckypapers. Current theranostic approaches in cancer therapy demand delivery systems that can carry multiple drugs or imaging agents in a single nanoplatform with uniform biodistribution and improved target specificity. In this study, we have developed amphiphilized poly(ethyleneimine) nanoparticles (aPEI NPs) as a versatile multi-cargo delivery platform. The aPEI NPs were engineered to have the loading capacity for both hydrophobic molecules and negatively charged hydrophilic colloidal cargos through amphiphilic modification, i.e., octadecylation and subsequent PEGylation of poly(ethyleneimine). In aqueous phase, the resulting aPEIs underwent amphiphilic self-assembly into spherical nanoparticles whose structure is constituted of the hydrophobic core with the positively charged surface and the hydrophilic neutral corona. The high degree of PEGylation resulted in the tiny colloidal size (<15 nm in diameter) and rendered the outmost surface coated with an antifouling corona which minimizes general shortcomings of poly(ethyleneimine)-based nanocarriers (e.g., cytotoxicity and liver filtration) while keeping its advantage (loading capability for negatively charged drugs). The unique nanostructure of aPEI NPs allowed for facile loading of hydrophobic model drugs (rubrene and IR780) in the core as well as negatively charged colloids (Pdots, proteins and DNA) on the inner surface via the hydrophobic and electrostatic interactions, respectively. Fluorescence imaging experiments demonstrated that the highly PEGylated aPEI-25 NPs showed prolonged blood circulation with minimal liver filtration and efficient delivery of the loaded cargos to the tumor. These combined merits, along with negligible toxicity profiles both in vitro and in vivo, validate the potential of aPEI-25 NPs as a versatile nanocarrier for multi-cargo delivery. Transparent conductive films (TCFs) based on oxidized single-walled carbon nanotubes (SWCNTs) are not typically fabricated because this type of SWCNT includes sp3 carbon centers, which impede carrier transport. The acidic carbonaceous fragments (ACFs) that are created during oxidative reactions act as dispersing agents, enabling the dispersion of SWCNTs without additives. However, the structure of ACFs prohibits carrier transport in networks; thus removal of ACFs from the SWCNT networks is essential for improving TCF performance. In this work, we used this idea in order to fabricate ACF-free high-performance TCFs based on oxidized SWCNTs. The ACFs were initially used as dispersing agents. They were then dissolved and removed after the formation of a SWCNT network. The functional groups introduced onto the oxidized SWCNTs were mainly distributed across acidic carbonaceous fragments (ACFs), whereas the SWCNTs remained unmodified. 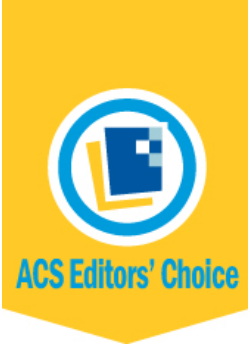 The removal of the ACFs improved the performances of the TCFs. As the sizes of the unmodified SWCNT bundles decreased, the performances of the oxidized-SWCNT-based TCFs improved (σdc/σop = 14.7), providing properties comparable to those of films prepared using a surfactant-stabilized dispersion. Thermoelectrics is a challenging issue for future energy harvesting and cooling technology. We here have demonstrated a new system of the tellurium nanowire (TeNW) films hybridized with single-walled carbon nanotube (SWCNT) as a flexible thermoelectric material and investigated their thermoelectric properties as a function of SWCNT weight ratio in the hybrid. The excellent mechanical stability and electrical conductivity of SWCNT enhance the flexibility and thermoelectric properties of the pure TeNW film. The addition of 2 wt% SWCNT into TeNW matrix significantly increases the electrical conductivity from 4 to 50 S m−1 while maintaining the high thermopower, thereby leading to one order of magnitude higher figure of merit (ZT) compared to the pure TeNW film. These results indicate that the SWCNT/TeNW hybrid film would be promising for a potential use as a flexible thermoelectric material. In this study, the effects of various annealing conditions on tungsten film fabricated by atmospheric plasma spraying (APS) were studied to analyze the APS tungsten film and an adequate strategy for the improvement of the mechanical properties of the tungsten film. In general, the use of the APS method to create tungsten films results in splat boundaries in an oxidized state not unlike semi-cracks. We therefore conducted vacuum annealing of the tungsten film at 800 °C and 950 °C under less than 0.1 Torr pressure to strengthen the binding force between splats. Additionally, we conducted press annealing in order to achieve a more dramatic improvement. The micro-hardness of the as-sprayed tungsten film, the vacuum-annealed tungsten film, and the press-annealed tungsten film were 1.55, 1.52, and 2.19 GPa respectively. By utilizing analysis methods such as electron back-scatter diffraction, scanning electron microscopy, Raman spectroscopy, and nano-indentation, we found that filling the gap between the splats, while eliminating the oxides, played a critical role in enhancing the mechanical properties of the tungsten film fabricated by means of the APS method. Graphene oxide (GO) was recently reported to assemble into one-dimensional fiber precursors that can be used to produce next-generation multifunctional graphene-based materials. This study describes the facile fabrication of GO fibers with excellent mechanical properties, utilizing a diamine cross-linker that forms ion bridges between the GO layers. Organic co-coagulants and post-drawing processes, which are usually employed in typical GO spinning processes, were not used here. The GO layers readily aligned along the spinning axis, and the GO formed closely packed structures in the fibers. The fibers displayed a Young’s modulus of 26.6 GPa and a tensile strength of 384.3 MPa in maximum. The interlayer microstructure of the GO sheets could be tuned by modifying the structures of the cross-linking diamine groups, yielding a range of mechanical properties. These observations suggested that our newly developed GO fiber synthesis method could enable applications of graphene-based fibrous materials through GO surface chemistry modification approaches. Reduced graphene oxide-based films were prepared to assess their effects as gas barriers on the stability of organic photovoltaic (OPV) devices. The direct spin-casting of a graphene oxide suspension onto an aluminum electrode was performed to encapsulate the associated OPV device with a reduced graphene oxide film. The lifetime of the OPV device after the reduction process was found to be increased by a factor of 50. The gas barrier properties of a graphene oxide layer are closely related to its surface roughness and dispersibility. Furthermore, these gas barrier properties can be enhanced by controlling the thermal reduction conditions. The thermal reduction of a graphene oxide film at a low heating rate results in a low water vapor permeability, only 0.1% of that of an as-prepared polyethylene naphthalate film. These results indicate that the dispersibility, surface roughness, and reduction conditions of a graphene oxide film significantly influence its gas barrier performance. Further investigations of the reduction of graphene oxide films are expected to enable further improvements in performance.